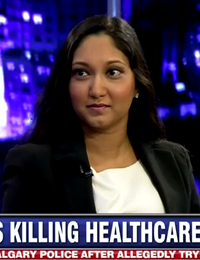 On March 4, 2014, Freedom Party and the Toronto Objectivist Committee co-sponsored a speech at the University of Toronto by the Ayn Rand Institute’s Rituparna Basu titled “The Disease Killing Canadian Healthcare”. She appeared that day on the Sun TV program “The Source” guest-hosted by Anthony Fury to discuss her talk. Rituparna’s speech was made at the University of Toronto Earth Sciences Building, 5 Bancroft Avenue, Room 1050.